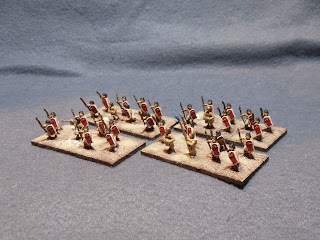 I finally finished up another batch of assorted 15mm NK Egyptians. 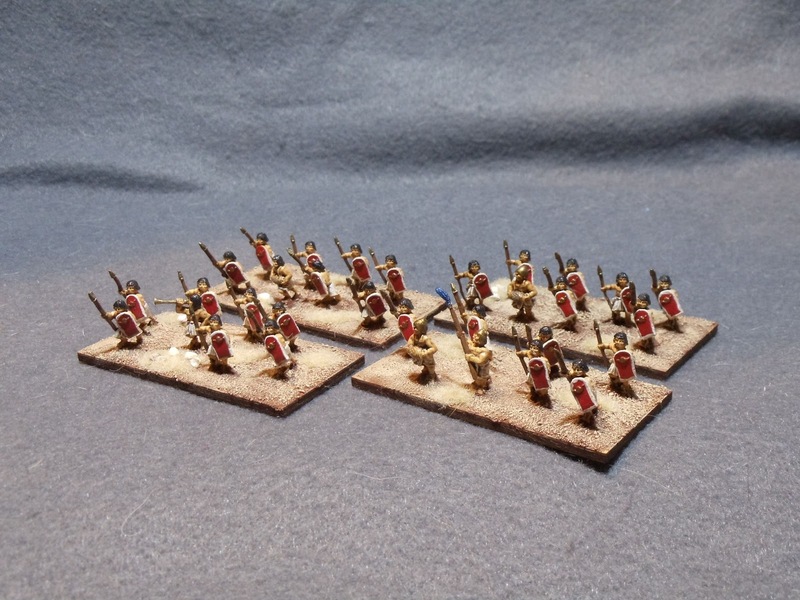 These figs are all Old Glory 15's. First is a group of 4 chariots. 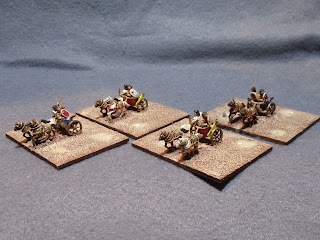 Next is a group of 4 line infantry. 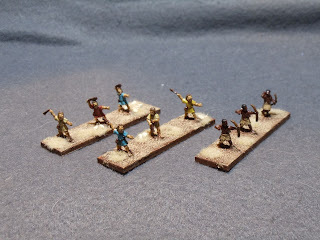 Finally there is 3 bases of skirmishers. The one on the right is a unit of Nubian short bow and the other 2 are "Asiatics" with slings. I'm not sure what I'm going to work on next. I've still got as bunch more Egyptians to do but I might take a break and start working on my 1/200 scale Robotech models. This past Saturday we had our annual MayDay convention. 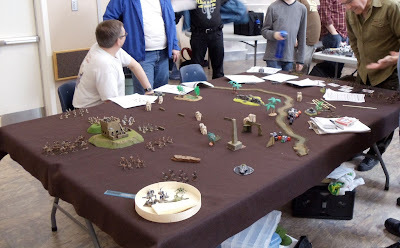 Here's some pics of the various games. 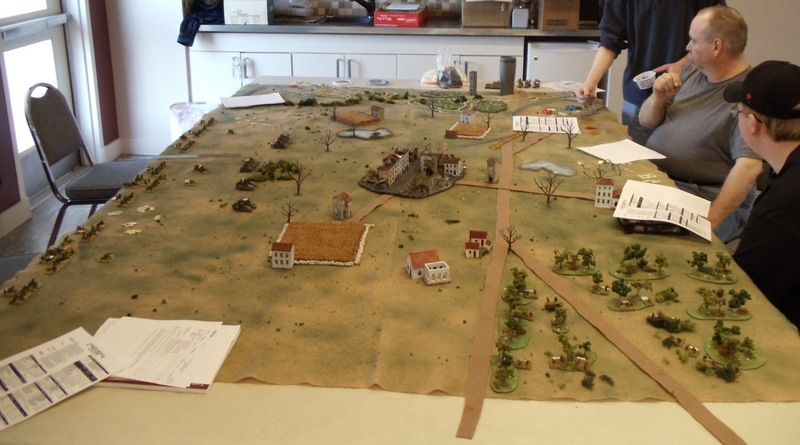 First is a pic of the Gaslight game. Evidently it featured multiple war bands, camels, a steam tank, a giant spider and even a dinosaur. I'm not sure which group won but apparently it was a hoot. 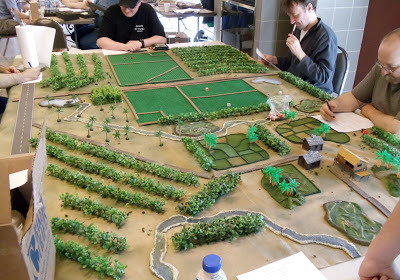 Next is a pic of Chen-Song's Tomorrow's War game. I believe the insurgents won this game. 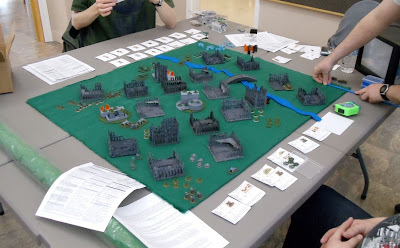 This next one is a pic of a Dark Age Apocalypse game. This was one of three games Warren ran, which was quite impressive. I didn't get a good look at the figs but the terrain was really nice. 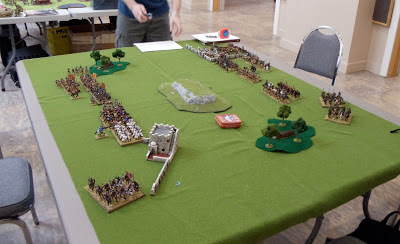 Next up is Dave's War & Conquest El Cid game. I participated in this one on the Christian's side. We narrowly got the win over the Muslim raiders. There's some really nice figs in this game. Next is a Command Decision 4 game, the Battle of somethingorother. I'm thinking it might have been in Italy. 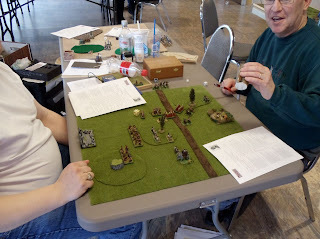 This game went on for two time slots and I have no idea who won but it looked impressive. I ran a game of War Rocket pitting a Zenithian force against a force of Pirates that were in the process of looting a crashed Zenithian mothership. 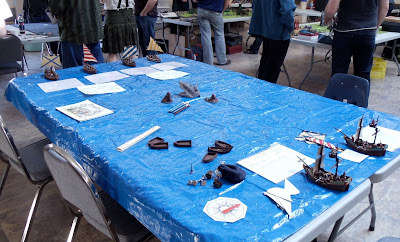 The pic doesn't really show the ships very well but I believe Terry's blog has better pics. 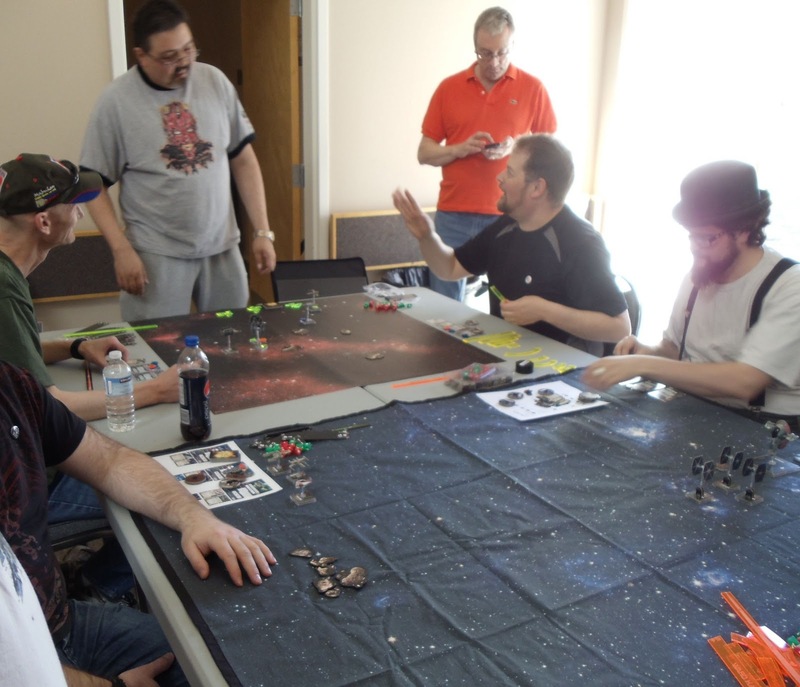 There were a couple games of X-Wing run. Here is Bob telling someone that he is strong with the Force. X-Wing is a great convention game as it's quick and easy to learn, doesn't bog down with lots of rules and the prepainted figs are really nice. I'm expecting we'll be seeing this game at next year's convention. There was a game of 6mm FUBAR. I didn't get a chance to actually look at hte figures but the terrain was really nice. Stu will have to bring this one out to club night again as I wouldn't mind giving it a go. 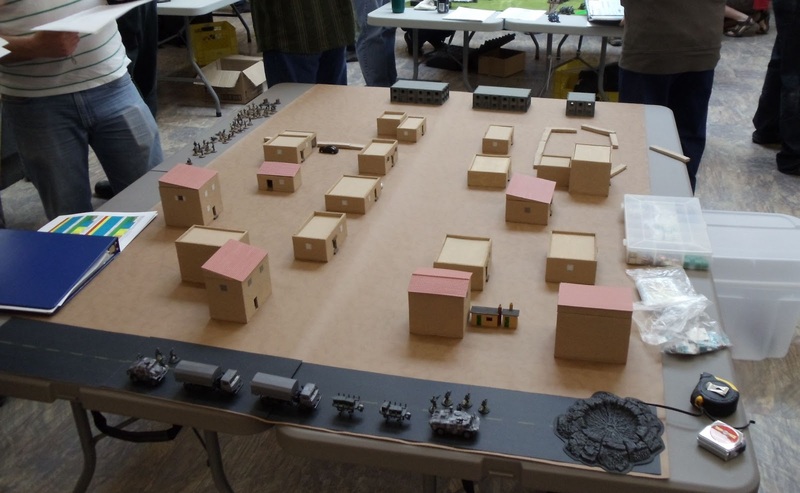 The other game I participated in was the third game run by Warren: 15mm Gruntz. I was eager to get in on this game as I'm still looking for a good 15mm sic-fi ruleset. 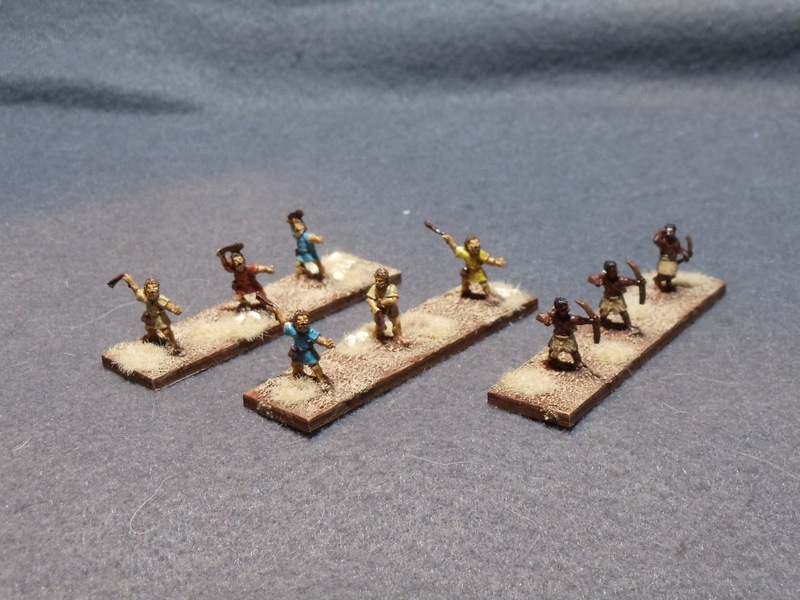 The terrain was superb and the figs really nice. The game pitted some colonial marines fending off a horde of aliens so the colonists can escape. In the end most of the colonists made it off but the marines died to the last man. 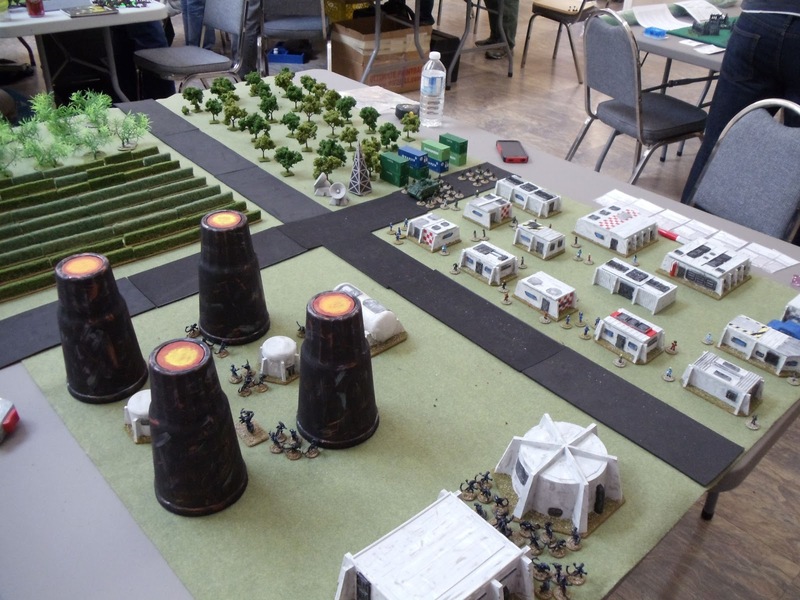 The aliens won due to the sheer numbers of kills they got. I think I'm going to pick up this ruleset as it may be what I'm looking for. Next is a game of Age of Piracy. Terry had painted up some nice ships and figures for this one. One of the highlights of the day when it came to terrain was Justin's game of Charlie Company. It was very green! I believe the US troops won this one. 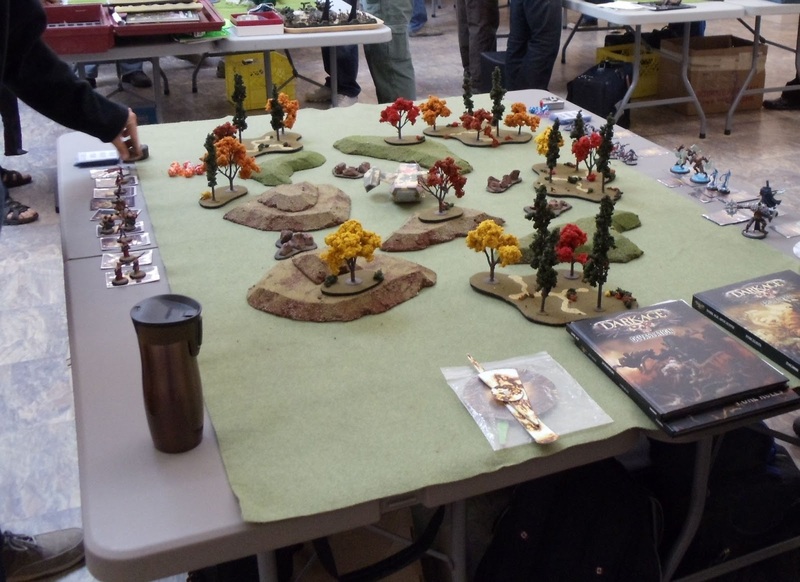 Also taking place all day was a Warmachine/Hordes tourney. 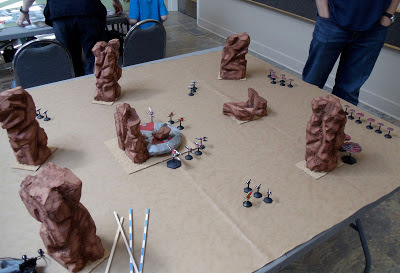 Kevin provided all the terrain for the 19 players which is pretty darn impressive. Hopefully we'll see another one next year. 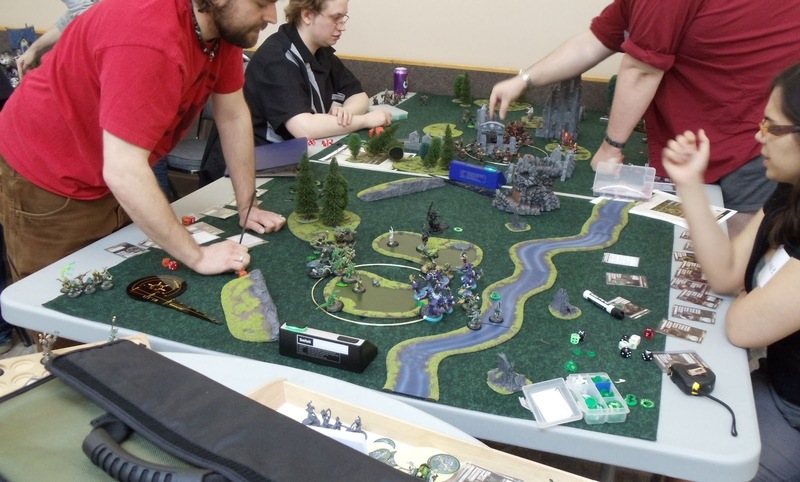 Like the Warmachine/Hordes tourney, there was an all-day Warhammer 40K tourney. Lots of infantry, tanks and flyers. The last tourney was a DBA tourney that I think Mark Wall won, but I'm not 100 percent on that. I was not able to get a pic of the Battlemasters game, Axis & Allies game or Zombicide game. Overall it was a great day of gaming and everyone had fun! Thanks to everyone who helped make this day possible.